Political parties contesting Saturday’s local government elections will have to end their campaigning at midnight today marking what the Elections Commission describes as the “period of silence”. It is worth noting that the election campaign was unprecedentedly calm with there being no sign of an upcoming election in many areas, despite of these elections being considered by the three main political parties -- the UNP, the SLFP and the SLPP considering it as a trend-setter for the next presidential and parliamentary elections to be held in 2020. Therefore, in a way these elections are in fact a do-or-die struggle for these three groups though the ground situation remains quiet and somewhat unelection-like when considering the violence and chaos at previous elections. We can remember that there were times when the election monitors were revealing details of election violence taking place on a daily basis during the elections. Sri Lankan political history has been tainted with horrific environments during elections such as the 1982 presidential election as well as the referendum in the same year under a UNP regime and the North-Western Provincial Council election in 1999 under a SLFP-led government. The relatively violence-free environment during the current election campaign which was also relatively free of mass-scale violation of election laws can be attributed to the new electoral system and to the firm stand taken by the Elections Commission headed by its Chairman Mahinda Deshapriya on implementing election laws. The scrapping of the much maligned “manape” or the preferential voting system and the introduction of the mandatory percentage of female candidates for wards with the new mixed electoral system seems to have contributed largely to the relatively calm situation. And the warnings by the Elections Commission Chairman with punitive action against the law breakers too seems to have produced results. The Elections Commission had been very firm this time on the issue of posters and processions. It has prohibited canvassing with more than 10 people tagging along with the candidate. Politicians and the officials are closely monitoring for campaign-time recruitment and distribution of goodies or freebies to voters. The Commission Chairman has even taken action to stop a parliamentary debate -- on the reports submitted by Presidential Commission of Inquiry on the Central Bank bond sales and the PRECIFAC report on large scale fraud and corruption -- being held during the ‘period of silence’ on the threshold of the elections. Nevertheless, there have been incidents where election offices of certain candidates in several places being damaged or set on fire; female candidates being threatened and harassed and in some areas even sexually harassed. On earlier occasions, secret campaigning had occurred during the silence period with a few people going house to house and distributing propaganda materials such as leaflets. We hope the Elections Commission would be mindful of such incidents which can disturb the hitherto relatively calm environment. 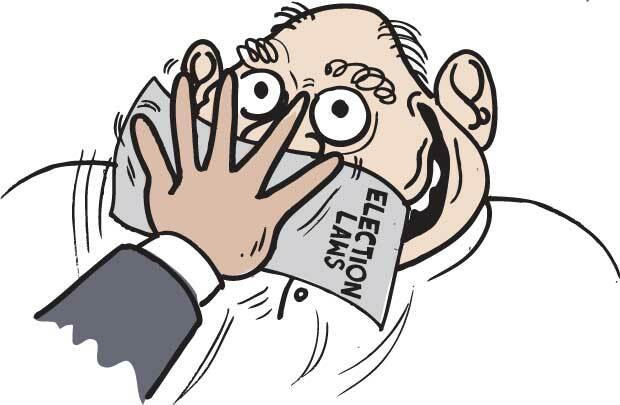 Since this is the first time the Elections Commission has introduced a new electoral system in the country; its merits and demerits could only be gauged at the conclusion of the elections. Already we find the mandatory quota for female candidates being filled by nominating ‘namesake’ candidates as a ruse to complete the required number of female candidates in the nomination papers. There is also the possibility of these candidates being elected or selected by leaders of political parties and independent groups under the new electoral system. Despite the newly introduced ward system replacing the “manape” system, the new system leaves the voter with no option other than to vote for the candidate fielded by his or her party for the ward, irrespective of the candidate’s merits or demerits. The election monitoring NGOs such as the Campaign for Free and Fair Elections (CaFFE) and the Peoples Action for Free and Fair Elections (PAFFREL) have already pointed out that some of the political parties have fielded corrupt and questionable candidates with the possibility of being elected or selected. Meanwhile, civil society organizations and religious leaders have called on the people to use their franchise wisely. It is only the voters who can take the initial step to clean up their local government bodies by electing untainted and educated candidates, who will selflessly serve the people and the country.